Have your video narrated by a professional voiceover artist of any gender, age or accent. We outsource to voice-over artists on a per-project basis, ensuring that we use the most suitable voice for your video. Listen to our playlist below to hear examples from our most popular voiceover artists. Please note that these examples represent the most commonly asked for voice types. If you can’t hear what you’re looking for that’s no problem – we can use a number of talent directories, casting databases and voice-over agencies to find the most suitable voice for your project. Need your video dubbed into another language? No problem. To date, we’ve worked with French, Spanish, Portuguese and even Arabic language voice-over requests for a variety of promotional and training videos. Whether you’re supplying somebody to read the script in another language or you need our help to source a foreign language voice-over artist, we’ll make sure your message comes across loud and clear. On the right, you’ll find an example video that was originally produced in English but has been dubbed in French. If you’re trying to build your personal brand, or simply want to reduce the overall cost of your project, recording a voice-over yourself can be a great option, which we can facilitate. 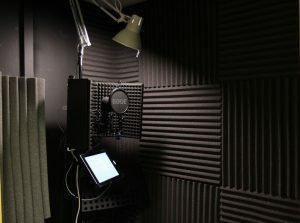 Our studio in Southampton is fitted with a noise-dampened voice-over booth, allowing us to record you or a member of your company’s staff to a professional standard.